Situated by the shores of Loch Alsh in the Scottish Highlands, Rendall's of Lochalsh (formerly Rendall's of Edinburgh) supplies traditional handmade pure new wool kilts, full highland outfits and accessories. By choosing Rendall's, you can be confident that your kilt will be of the finest quality, individually tailored to your exact requirements. 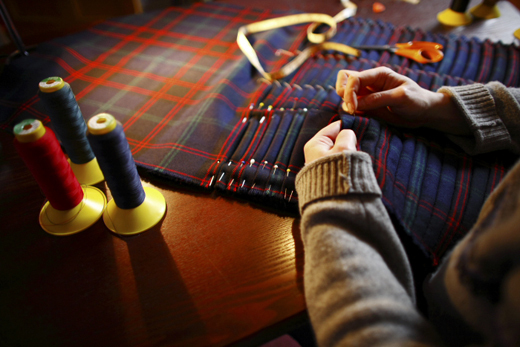 From your initial enquiry to taking delivery of your kilt, you will be dealing exclusively with the kiltmaker. This gives you, the customer, a level of care and attention to detail hard to find in many High Street kilt retailers, and a degree of service essential to purchasing a bespoke tailored item. Each kilt is completely hand sewn from around eight yards of pure new Scottish wool, in either medium (13oz) or heavyweight (16oz) tartan cloth. Each pleat is stitched following either the pattern of the tartan (pleated to the sett) or if you prefer, pleated to a dominant stripe in the tartan (regimental). Having served a 5 year apprenticeship with the highly esteemed kiltmaker Antonia Campbell of West Lothian, I then went on to supply some of Edinburgh's best-known stores with kilts, while also providing a personal bespoke service to private customers. 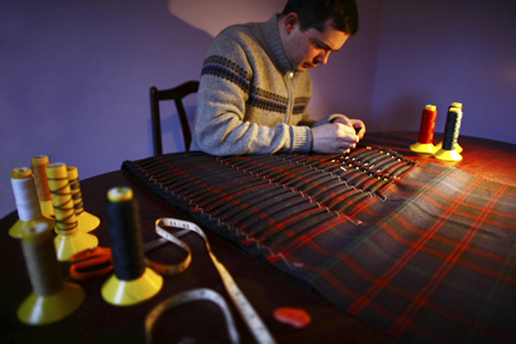 I now make the kilts from my home in the Highlands, shipping them all over the world. I have been kiltmaking for fifteen years and take great pride in turning out a beautifully tailored kilt.